Yoga is a very popular pastime and having the right yoga pants can make the difference between being comfortable during your workout and feeling restricted. There are tons of yoga pants on the market today. It may seem like they are all the same, but there are features that the top rated yoga pants have that others don’t. We’ve featured three of the top rated yoga pants available so you can see what makes them superior to others. Knowing the differences will make your choices much easier. There are many different brands out there and sorting through them all trying to figure out which ones are durable, made well, comfortable and sized right can be quite a challenge. That is why we have brought you these three top rated yoga pants. Customers love them because of the color choices, comfort factor, they last a long time even through washings and they are reasonably priced as well. You may not be in the habit reading reviews about something like yoga pants but the information in this review can help you choose the pants that will enhance your workout and not restrict it. The highest quality fabric is used to make these comfortable and function yoga pants from 90 Degrees. These pants are the perfect pants for yoga but can also be used for exercise and fitness of any kind. They also make great pants for just lounging around the house after a long day. One of the great features of these pants is their ability to wick away moisture from the body to keep you comfortable and dry. There are thousands of customers that love these leggings and thousands of people can’t be wrong! If you’re looking for a great pair of yoga pants for any reason and you want a large variety of colors to choose from, you don’t need to look any further. They are so confident that you won’t find another pair of yoga pants that you like better that they offer a full, 100%, no questions asked money back guarantee. With a guarantee like that customers can be confident that the company stands behind their product. These pants are made up of a blend of materials. Solids are 87% Nylon, 13% spandex, Heather design is 47% Nylon, 46% Polyester and 7 spandex and the Space Dye is 90% Polyester and 10% spandex. These super soft cotton yoga pants are the ultimate in comfort. Made from a combination of 87% cotton and 13% Lycra spandex that feels good all day long. The 4 ½” rollover waistband is stylish and doesn’t cut into the body. These are the perfect yoga pants for yoga, jogging, walking, lifting weights or just lounging around the house on the weekends. Available in S, M, L, XL and 2XL. 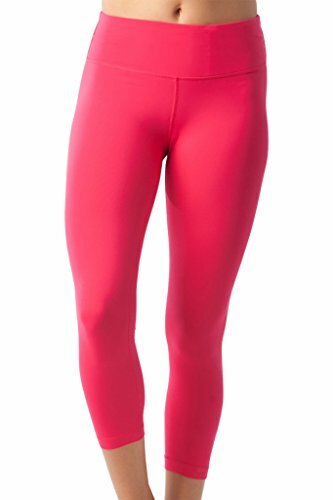 There may not be different color varieties of the Alki’I Women’s Cotton Lycra Foldover Yoga Pants, but once you wear them you’ll never want to take them off. The stretchy material is perfect for reaching all those difficult yoga poses and you don’t have to worry about the material cutting into the body or hindering your movement. People love these yoga pants so much that they wear them for casual outings and relaxing as well as working out. The inseams on these pants are S- 28” to 29”, M- 30” to 32”, L- 33” to 35” and XL- 33”. You don’t have to look any further for comfortable and functional yoga pants that look great in the gym or around town. Not only will these yoga capris be terrific to wear for your yoga workouts, they’ll look fashionable as well. The 22” Power Flex Capris offer 4 way stretch fabric that supports and also wicks away sweat and moisture as well. The wide waistband gives the wearer a streamlined shape that looks good in or out of the gym. The Power Flex Capris are made to stay in place regardless of how much you are bending or stretching. You won’t be pulling and tugging on these during your workouts because they won’t ride up, fall down or dig into your skin so much they leave indentations. The convenient key keeper pocket for you to keep belongings in, you won’t have to lug around a big purse. The seams are interlock design that is designed to reduce the chafing and irritation that others traditionally cause. These comfortable and functional capris yoga pants are made up of 87% Nylon, 13% spandex for the solid colors, 47% Nylon, 46% Polyester and 7% spandex for the Heather style and 90% Polyester and 10% spandex for the Space Dye design. Wearers will have a vast array of color choices to pick from. Get several pairs for different work out days. When people look for workout clothing, they want something that is going to be functional and comfortable and they want to look nice too. All three of these top rated yoga pants have both function and fashion in common. They are customer favorites due to the quality of the material used, the durability, comfort and style as well. There are some things that you can do to ensure that you choose the right yoga pants. We’ve included a detailed buyer’s guide that will give you the features that make up a great pair of yoga pants. This information will help you narrow down the choices among the many that are available so you can choose the yoga pants that will fit the preferences and needs you have. What is a Yoga Pant? Most women have some form of yoga pants in their closets. Not only are they comfortable for doing yoga or other exercises in, they are just comfortable in general for wearing around the house or on casual outings. Rough seams and tight constrictive clothing is not enjoyable to wear, but most people don’t want to wear baggy, ill-fitting clothing either. The right yoga pants are comfortable enough to wear all day long and if you pair them with the right shirt, can even be worn out in public. One of the biggest factors in staying comfortable when doing yoga is how you’re dressed. Yoga pants are designed to be very lightweight, non-restrictive and super comfortable so you can go through the poses that yoga entails without your clothing getting in the way. There are several things to look for when deciding on a pair of yoga pants. These features are what you want to look for when you begin researching different brands and styles. Look for Breathable Fabrics- look for yoga pants that are made with fabrics that breathe and let air circulation in. Bendable and Loose – There is a lot of bending involved in yoga so you want to select yoga pants that are easy to bend in and that are also loose. You don’t want them so loose that you get tangled in them or that fall off, so choose the correct size when you purchase a pair. These are not something you purposely want to buy too big or too small. The correct size is what will provide the most comfort. Color Choices – While color is not something that technically affects the decision as to whether a pair of yoga pants is good, it is a customer preference. There are so many colors and styles out there that a yoga enthusiast can choose to have a bunch of different pairs in all different patterns and colors. Workouts don’t have to mean no fashion and all the same color. Length – Length is another factor that is more about personal preference. Good yoga pants will come in different lengths so you don’t have to choose a length you don’t like. Yoga pants are available in full length with a flared bottom, full length, legging style, and capris length. Durable – Many times a less quality fabric will lose its strength once it has been washed several times. You will want to check the customer reviews in this regard to see if customers have posted about the durability and long lastingness of the yoga pants you are considering purchasing. The kind of fabric that is used to make up the yoga pants will also be a telling factor. Breathable fabrics are fabrics that are lightly woven to let the air pass through the fabric to the skin. These types of fabric are ideal for yoga because they help absorb sweat during the workouts and they prevent the body from overheating. There are several breathable fabrics that work well for yoga pants. Cotton – Cotton is the most popular breathable fabric. It’s loosely woven, allowing plenty of air to pass through the fabric during the time you are wearing the pants. Cotton is also extremely soft and very lightweight. It’s not a super durable fabric that shrinks when it is washed a couple of times. It also doesn’t hold its shape well, so wearers will notice that the size and shape of the yoga pants will change once it’s been worn and washed several times. Since the fit of your yoga pants is a factor in the comfort of wearing them, the altered shape, either too loose or too tight, could prove to be a problem. Cotton Blends – Since pure cotton tends to be a more fragile fabric, prone to shape changes, designers came up with cotton blends. These blends are a combination of cotton and synthetic fabrics that increase the strength of the cotton while not losing its benefits. Cotton and spandex is probably the most common blend that is used in the manufacturing of yoga pants. The combination of spandex and cotton combines the softness and comfort of cotton with the shape holding properties of spandex. Spandex by itself is not a breathable fabric but it is known for its ability to hold its shape no matter how often it’s worn or washed. When these two fabrics are combined, the result is a very good quality yoga pant that provides the wearer with the ideal combination of comfort, softness, breathability and shape holding. Microfiber – This synthetic fabric is a lot more durable than cotton but still has the breathability that wearers of cotton love. It’s lightweight and very soft which makes it a pleasure to wear regardless of whether you’re working out or just running an errand. Another benefit to microfiber is the wicking properties it has that pull moisture from the body. This is great when you are working out. It also doesn’t shrink even when washed and dried. Even though fitness companies may make clothing from polyester and nylon, it is not a good fabric to use for yoga pants. Neither are breathable fabrics and can hold moisture up against the skin. This can cause painful rashes to develop where the skin is staying damp. Because of the tighter weave that these fabrics possess, users will notice that they block air as well making it much easier to overheat. Many of the great yoga pants have combinations of these materials. For example, if pants have a mixture of nylon and cotton or spandex and cotton, these will be fine and will still perform the way you need them to. The waist band of your yoga pants need to allow freedom of movement without restriction or constriction. The yoga pants that have the elastic waistbands are best because they allow this freedom of movement. Drawstring yoga pants may be fine for kicking around the house, but when it comes to performing yoga, a drawstring waist can really restrict movement and cause discomfort and freedom of movement issues. Yoga pants are popular with people even when they are not doing yoga. There are many different styles and leg cuts that work for all kinds of activities from yoga to running to casual wear. Flare/boot cut – This is probably the kind of yoga pants that are seen and purchased the most often. They can be work as exercise pants, maternity pants, casual wear and of course for yoga. Because of the style of the leg, they can be worn with gym shoes, sandals or even flip flops. Whether you’re very small or even if you have larger thighs, this style and cut will work well. Full length Leggings – Leggings were popular many years ago, worn with very short baby doll dresses or long tunic style shirts. They are still just as popular. Leggings will show the contour of the leg much more so than other cuts, so if you don’t like the size or shape of your legs, you may not like full length legging style yoga pants. They are very good for yoga and general working out including running in cooler weather. Capris Pants – Capri style yoga pants are also popular with women for yoga and working out. They are cut right above the knee or just below it. It’s a great look for working out and casual wear as well. Straight cut –This style clings to the upper thigh and has a straight cut leg that falls straight to the floor. This style of yoga pant can be very flattering for curvier women. This is a great style for working out on cardio equipment, yoga and other forms of exercise. There are several things you can do to keep your yoga pants in good shape so they last for a long time. Even though they may not be tremendously expensive, you still want them to last a good length of time so you do not have to buy more frequently. Don’t wash your yoga pants with towels – Cotton pills from the towels will latch onto the fibers of your yoga pants and it will look like you are wearing an old outdated sweater. Wash yoga pants with similar fabrics – your yoga pants can get snagged when you wash them with other non-like fabrics, for instance, washing yoga pants with jeans. The zippers and buttons can snag the yoga pants or cause strings that can turn into pulls that will ruin your yoga pants. Wash cottons with cottons and synthetics with synthetics for best results. Don’t Use too much Detergent – Using too much detergent can actually weaken the fabric of your yoga pants. Use just a little bit to take the sweat and any odors out of your yoga pants and you will be fine. No Fabric Softener – Any wicking ability your yoga pants have will be eliminated by using fabric softener in your wash.
Wash in Cold Water – synthetics don’t do well being washed in hot or super warm water. Use cold for washing. This will not only keep the color vibrant and not faded, it will keep the integrity of your fabrics as well so your yoga pants last a lot longer. Using the Dryer is Fine – Drying your yoga pants in the dryer can cause them to shrink a bit, but the dryer doesn’t have to be the enemy. Use a lower heat setting or if you have the resources, hang them out on the line to dry. Most people don’t care of the yoga pants shrink a bit so if that doesn’t bother you, using the dryer will be just fine. You may think that it doesn’t matter what color yoga pants are but having the right work out clothing will motivate you to go to the gym and work out your hardest. Even though people who workout are doing so to lose weight, stay in shape or improve certain parts of their bodies, looking good makes a big difference in how you feel while you are working out. Light colors will show flaws more readily than dark colors so if there is something you want to camouflage a little bit, you may want to consider wearing black, navy or charcoal grays. Another good reason to wear darker yoga pants is that lighter colors tend to show sweat marks much easier and that can lead to embarrassment for the person working out. Check the length of your yoga pants – Wearing yoga pants that are too long only results in frayed hems that look unkempt and sloppy. Make sure that you purchase pants that are the right length and if they are too long, take the time to get them hemmed properly. They will last longer and look better. Buy the size you wear NOW – Buying “goal” outfits are fine to motivate yourself but yoga pants need to fit the size you are currently so they don’t impede your workout. You can always purchase new ones as you lose weight and get smaller. Buying them too small causes constrictions that will hamper your movements. Buying them too big will also hamper your movements and they could simply fall down while you’re performing stretches as well. When the waistband loses its elasticity – Once your yoga pants have lost their elasticity it’s time to purchase a new pair. Saggy waistlines will get in the way of a comfortable workout because you will constantly be tugging at them to keep them up. Yoga pants are a major part of participating in yoga as an exercise but that is not where their usefulness stops. In addition to having a comfortable outfit to do yoga or other forms of exercise in, they are great lounging pants, maternity pants, and some even wear them as pajamas. There are many different styles and lengths that can be chosen so take into consideration what you like and what type of exercise you’ll be doing when you start researching. The top rated yoga pants that we have featured are all top of the line in manufacturing, performance, longevity and function. The information in this buyer’s guide will aide you in choosing the right pair of yoga pants that fit your body, your style and your preferences. When you have the correct knowledge choosing what you like and what will work for you becomes easy. What is a Chicken Gizzard?